Pratibha Vemulapalli, MD, Lindsay S Cumella, BS, Emmanuel Agaba, MD, Diego Camacho, MD, Jenny Choi, MD, Mujjahud Abbas, MD, Scott Chudnoff, MD. Albert Einstein College of Medicine, Montefiore Medical Center. It has been well established that hyperlipidemia has a high resolution rate after bariatric surgery. However, hyperlipidemia is a catch all phrase for 4 specific indices, specifically cholesterol, HDL(high density lipoprotein), LDL (low density lipoprotein), and triglycerides. These markers have varying significance in quantifying patient risk. We know from the metabolic syndrome that HDL and triglyceride are key indicators of risk from heart disease and stroke. Therefore, lowering these particular agents is crucial when looking at the lipidemic profile of the post bariatric surgery patient. We sought to quantify which of the 4 components of hyperlipidemia resolved following bariatric surgery and specifically looked at HDL and triglyceride. A retrospective review of all consecutive patients undergoing bariatric procedures at a tertiary facility over a 6 month time frame was done. Patients underwent one of three procedures: laparoscopic band, laparoscopic bypass or laparoscopic sleeve gastrectomy. Lipid profiles were examined at various times points including two months preoperatively, and various post-op time points including 2 weeks, 3 months, 6months, 9 months and 12months. Lipid profiles included HDL, LDL, triglyceride and cholesterol. Statistical analysis was done using SPSS software and Pearson correlation. Included in the study time frame were 105 patients with a 35% incidence of hyperlipidemia on cholesterol lowering medications. 80% were female and 20% were male. Ages ranged from 19-65. Patients lost on average 70lbs. Lap band accounted for 8% of all procedures, lap sleeve gastrectomies accounted for 30% and the remaining 62% were roux-en-y gastric bypass. Over the 12 month period all lipid indices measured decreased. However, the change in LDL and cholesterol was not statistically significant. The change in HDL and triglycerides were statistically significant at 12 months. 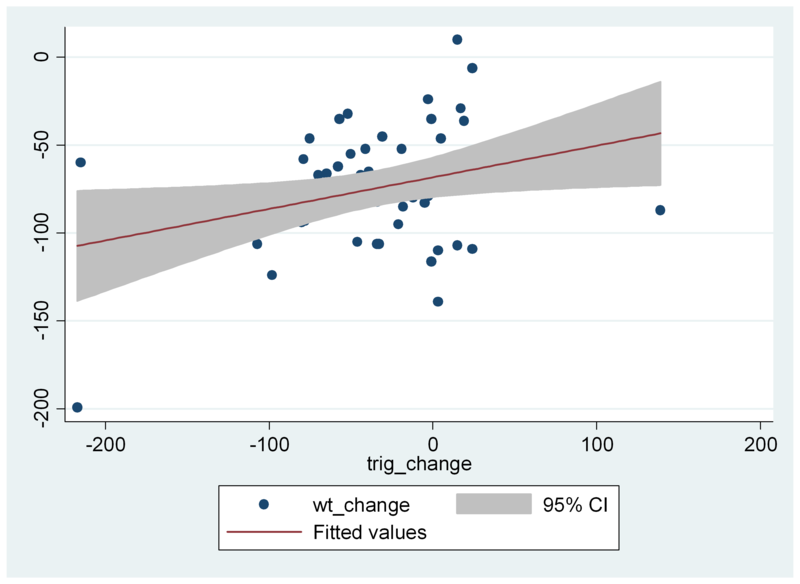 In addition, when comparing degree of weightloss to change in HDL(P<.05 and a R= -0.28) and triglyceride(P< 0.5 and R=0.31), there was a statistically significant correlation. This suggests that the greater the weightloss the more significant the rise in HDL and the greater the weightloss the greater the drop in triglycerides. An additional phenomena was seen in the data, at two weeks a deleterious change was seen in all lipid indices prior to improvement. 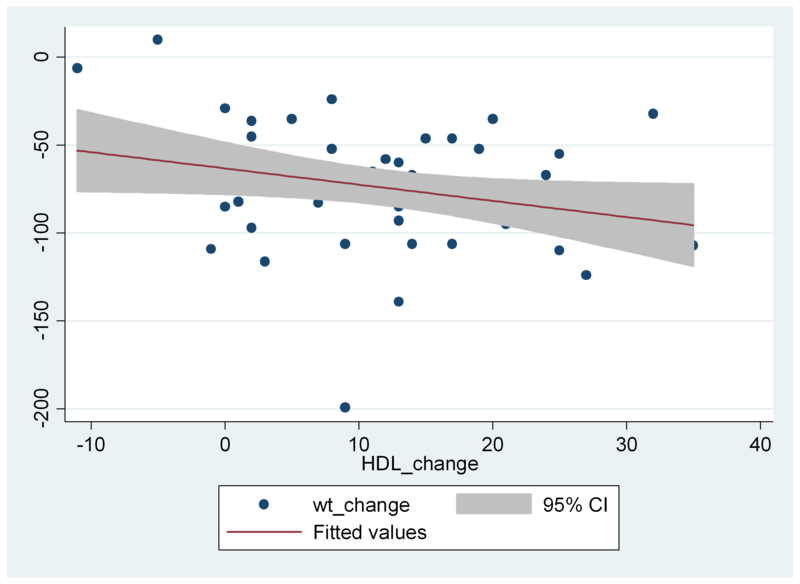 Bariatric surgery shows a significant decrease in triglyceride and increase in HDL, both of which are correlated to the degree of weightloss. This is especially important for patients with metabolic syndrome.